Complete source of the elements and molecules directly used by corals, clams, and other reef-building invertebrates and organisms to create skeletal material and grow. Provides calcium, strontium, magnesium, and potassium in approximately the same ratios in which they occur in aragonite, the mineral that is primarily secreted by reef-building marine organisms under normal environmental conditions. Very strong source of carbonates, also involved in aragonite formation; twice the calcium relative to carbonates compared to natural aragonite. 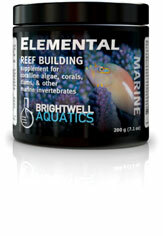 Brightwell Aquatics Elemental has twice the calcium relative to carbonates as compared to natural aragonite, making it a very powerful calcium source. The active components of Elemental are provided by a combination of sources and include natural aragonite, increasing the solubility of the solution and the effectiveness of the method. Silicate- and phosphate-free. The advantage to this method of supplementation is that one product may be used to establish and maintain water parameters conducive to reef formation. Note that target ion-specific supplementation may be called for in some aquaria, depending upon stocking density of reef-building organisms and environmental conditions within the system. Additionally, hobbyists may choose to use Elemental in conjunction with other methods of calcium, strontium, magnesium, and carbonate supplementation as a means of diversifying their dosing routine. Basic: Dissolve 2 grams (~½ teaspoon) of product per 20 US-gallons of aquarium water in 8-fl. oz. of fresh water; stir immediately prior to use and add every other day to provide important elements to reef-building organisms. May also be added directly to an area of high water flow. When used in this fashion, 400 g treats up to 4,000 US-gallons (15,141.6 L). May temporarily cloud aquarium water after addition, therefore it is recommended that the product be dosed at night. Advanced: Create a stock solution by dissolving 20 grams (~5 teaspoons) of Elemental in 8-fl. oz. of fresh water (preferably purified); each ml of stock sol’n will increase the calcium concentration (”[Ca2+]”) in 1 US-gallon (3.785 L) of water by 5.1 ppm, alkalinity by 0.213 dKH, strontium by 0.100 ppm, magnesium by 0.015 ppm, and potassium by 0.003 ppm. Stir stock sol’n vigorously immediately prior to addition. If initial [Ca2+] in aquarium is below 412 ppm, add stock sol’n at maximum rate of 10 ml per 20 US-gallons daily until desired [Ca2+] is attained, then dose daily or weekly as needed (see below). Maintain [Ca2+] within a range of +/-10 ppm. Once desired [Ca2+] has been acquired, measure aquarium’s [Ca2+] at the same time each day over a one- to two-week period to determine the daily rate of calcium uptake (i.e. the decrease in calcium). To determine daily dosing rate (preferable to weekly dosing): estimate volume of water in entire aquarium system (US-gal. ); divide the daily decrease in [Ca2+] by 5.1; multiply this number by volume of water in system to obtain daily ml of stock sol’n required to maintain stable [Ca2+].